Your roof is one of the most important parts of your home. It can also be one of the most expensive to repair or replace. If you neglect regular maintenance, you may find yourself stuck with some rather hefty repair bills. But there are easy ways to avoid expensive roof repairs. Knowing what to look for and when to call in a competent roofer can save you thousands of dollars in repairs and help your roof last as long as possible. Every roof has an estimated lifespan, but that span is usually given as a range. For example, a basic three-tab asphalt shingle roof can last 15 to 25 years. If you want to get the full 25 without sinking a bunch of money into repairs, you’ll need some regular maintenance. If you treat your roof right, you can enjoy it for its full projected lifetime and avoid expensive roof repairs. Maintaining your roof is like going to the dentist. It’s never a good idea to wait until you have a terrible toothache to go to the dentist. Keeping appointments for regular teeth cleanings has two benefits. It will keep your teeth healthy and avoid painful problems. It will also save you money in the long run, since cleanings are less costly than complicated procedures. The same is true of your roof. A little maintenance and regular care have a double benefit. It will keep your roof healthy and doing its job, like saving you from water damage and high utility bills. It will also save you money in the long run, since you will mostly avoid expensive roof repairs for large problems. Maintaining your roof to avoid expensive roof repairs is not hard, but it does take a little know-how. That’s why Eagle Watch Roofing is here to give you the low-down on the easiest ways to avoid expensive roof repairs for your home. They say cleanliness is next to godliness. While we can’t attest to the spiritual status of your roof, we can confirm that cleanliness is a hugely significant factor in its longevity. Nothing will age a roof faster than letting leaves, fallen debris, moss, and other materials pile up. Luckily, it’s not hard to keep your roof clean. The key is to be consistent. Don’t wait for your roof to become a mess. Get up there and do a cleaning at least once a season. Of course, you should only get on your roof if you feel comfortable. For more about safely inspecting your roof, check out this blog post. So what are you looking for when you clean a roof? The first thing to look for is leaves. Atlanta is a pretty heavily-wooded city. It’s great for the beauty of our homes and neighborhoods but places a strain on our roofs. Depending on the types of trees around your home, your roof can be covered in large leaves or tons of pine straw. Either way, keeping those tree dropping off your roof will extend its lifespan. Leaves can hold water, which is deadly for your roof. Moisture trapped under leaves can lead to rot and shingle damage, which is the first step in severe roof damage. When you’re clearing leaves off your roof, don’t neglect your gutters. Keeping your gutters clear is crucial for proper water drainage. If your gutters are clogged with leaves and other debris, water can pool at the edge of your roof. Water that pours out over your gutters instead of into it can also damage your soffit, siding, and foundation. But if you can keep your roof and your gutters clear of leaves and tree debris, you’ve taken a significant first step to avoid expensive roof repairs. One of your roof’s main jobs is to protect you and your home from storms. But one of your jobs is to protect your roof from storms. Check your roof after a storm to identify small problems early on and avoid expensive roof repairs. Here in Georgia, one of the most damaging parts of any storm is the high winds. High winds damage your roof in two significant ways. First, the wind can pull at your shingles, causing tears, loose shingles, or even blowing off a shingle or two. Second, the wind can blow small and large debris onto your roof, indirectly causing serious damage. After a storm, it’s important to check for any damaged shingles. Sometimes, you can see the damage from the ground. Dark patches or discolored areas may be a sign of shingle damage. If you want to avoid expensive roof repairs, you’ll have to deal with damaged shingles as soon as you find them. If a shingle is knocked loose by a storm, repairing it can be as simple as applying a little roofing cement and a couple of nails. Torn or damaged shingles can be replaced. These are cheap fixes that you can do now to avoid expensive roof repairs down the road. 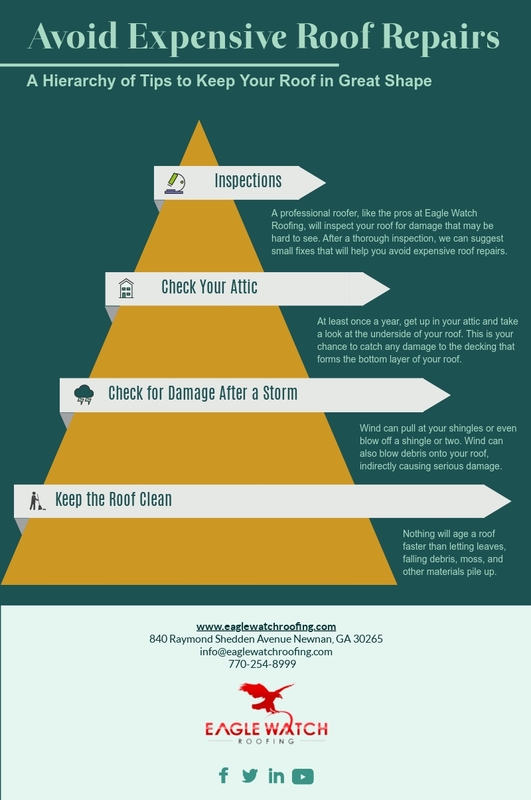 If any debris has fallen on your roof, take a hard look for damage it may have caused. A strong storm can bring down some pretty large branches. Even small branches that blow around your roof can scrape off your shingles’ protective granules. Look for dark areas where the tar underneath the granules is exposed. It’s crucial that you replace exposed shingles before the UV rays of the sun can break them down and cause leaks. A few shingles replaced now can avoid expensive roof repairs stemming from leaks and rot. Like most things in life, the best way to avoid expensive roof repairs is to stay on top of the little repairs and make them quickly. Keeping an eye on your roof means looking at more than just the outermost layer of your roof. To really get a full understanding of the condition of your roof, there are some other critical signs of roof damage to look for. Many people almost never think about their attics. But if you have an attic or crawl space between the ceiling of your home and the underside of your roof, you may want to get up there every once in a while. At least once a year, get up in your attic and take a good hard look at the underside of your roof. This is your chance to catch any damage to the decking that forms the bottom layer of your roof. Look for signs of water damage. The first and easiest sign to look for is a musty smell. Your attic may be a bit stuffy, but if it smells musty or moldy, that’s a sign something isn’t right. Look for any dark spots or water stains. If you have insulation, look for any rot or mold on the insulation. Moisture in your attic is not necessarily a sign of damage to your shingles. A common source of moisture in attics is condensation. Condensation can develop in your attic when there is a large difference in air temperature inside and outside the attic. Your best defense against condensation is adequate ventilation. Building codes recommend 1 square foot of ventilation for every 150 square feet of attic floor, split evenly between intake and exhaust. Learn more about attic ventilation in this post. As much as you want to keep an eye on your roof, there is no substitute for a professional roof inspection. How often you get your roof inspected is a matter of debate, but most roofers suggest about once every three years for a residential roof. A professional roofer, like the pros at Eagle Watch Roofing, will inspect your roof for damage that may be hard to see. Loose granules, small cracks in shingles, and tiny holes can be hard to spot on your own. We’ll also look at all of your flashing, rubber boots around roof penetrations, and other vulnerable parts of your roof. After we look at your roof, we’ll check out your attic or crawl space. After a thorough inspection, we can suggest small fixes that will help you avoid expensive roof repairs. If your roof does need extensive repairs, or if it has reached the end of its life and need to be replaced, we offer competitive pricing and the best quality work around. If there’s an insurance claim to be made, we can walk you through the whole process. We work with your insurance company from the first inspection to the final check to ensure you pay as little as possible. Contact us today to schedule your roof inspection and avoid expensive roof repairs! ← Repair or Replace a Roof?